A Makeup & Beauty Blog – Lipglossiping » Blog Archive Deal Alert: A covetable Jimmy Choo gift with purchase this month! Some “gift with purchases” are predictable but useful. Some GWPs make you wonder why the marketers bothered, and some… well, some make you tear down to your local counter Roadrunner stylee (meep meep! ), leaving nothing but a trail of dust behind you. I think it’s fair to say that the latest GWP – available when you buy any 60ml Jimmy Choo fragrance this month – very much falls into the latter category. 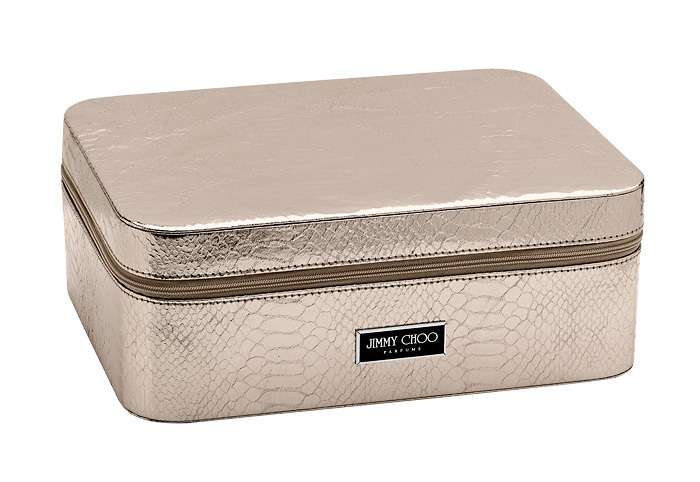 Please, let me present, the Limited Edition Luxury Jimmy Choo Shoe Case. Now, you may not own a pair of fancy Jimmy Choos to put in said shoe case, let’s face it… you wouldn’t be alone! But what else could you put inside? Your collection of favourite fragrances? How about employing it as a memory box for your most precious photos? It’s roomy and solidly-constructed enough for a thousand uses. This delightful GWP is available in selected department stores nationwide, with a purchase of any Jimmy Choo 60ml fragrance, while stocks last.